Today, Der Spiegel has reported that, according to experts of the Rhineland-Palatinate government, the building of the controversial 130-million-euro High Mosel Bridge (Hochmoselbrücke) entails great risks, which is good news for all those who are against it, including yours truly. 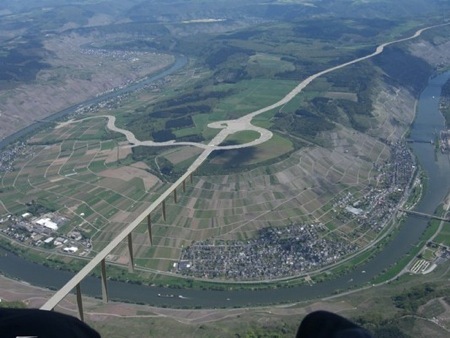 The State Office for Geology cautions against the construction of the 150-meter-high bridge pillars on the left bank of the Mosel River because of "structural and financial risks." The experts are referring to geological "slippery [slate] surfaces" on the slope, which can go down as far as 70 meters below the surface and are "not safely explored." They assess the "geological risk" as "very high." In other words, the slate slope, located upriver from Ürzig, is the reason for the risk. Katharina Prüm of Joh. Jos. Prüm told me about it earlier this year. The Federal Ministry of the Interior contends that "it's challenging," but "it's technically manageable." The report goes on to say that it's the largest bridge project in Europe at the moment and will provide a better connection between Frankfurt Hahn Airport in the Hunsrück and the Eifel region. The budget airline Ryanair flies from Hahn. The bridge, which will span 1.7 kilometers and will be about 160 meters high (higher than the Cologne Cathedral! ), is supposed to be completed in 2016, along with 25 kilometers of access roads and 39 other bridges, plus a tunnel (23 of the bridges are already completed). 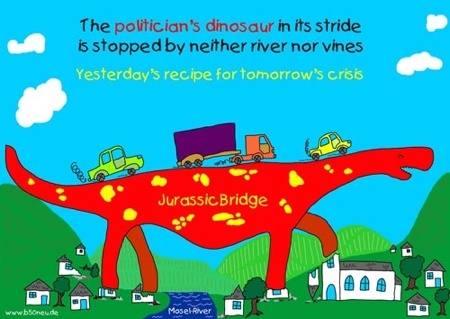 The costly High Mosel Bridge is being built between Ürzig and Zeltingen-Rachtig in the Middle Mosel, despite protests from leading producers (Joh. Jos. Prüm, Dr. Loosen, Willi Schaefer, and Rita & Rudolf Trossen, among others) and the international wine press (most notably Hugh Johnson and Stuart Pigott). The massive and questionable bridge project, going back to the 1950s’ Cold War, includes a four-lane highway (the so-called B50 neu) running along the ridge between Zeltingen and Bernkastel, which is the most famous stretch of Mosel vineyards. It remains unclear how the highway on the plateau above—rather than the bridge itself—might affect the vineyards below. (Unlike in Winningen, the bridge would not cross over any prime vineyard land. The road on the plateau, however, runs close to the top of some vineyards, especially near Graach.) Many of the trees on the ridge have been removed, which could affect the water supply. There are concerns about runoff from the roads, too. In late October 2012, workers began to bore holes for the pillars. This unfortunate project is moving forward and doesn’t help the region’s image. For those who don’t know, the bridge would be part of an old plan for a larger road network that better connects, for example, the Belgian and Dutch North Sea harbors and Frankfurt Rhine-Main. Most observors don’t feel that the bridge is necessary, however. On Twitter, I came across the following update on Jancis Robinson’s website, via Dr. Loosen Wines. The bridge is deemed unstable on the Ürzig side of the slope. Last week, I visited several producers on the Middle Mosel and noticed that the construction is moving forward on the slope by Zeltingen-Rachtig. The pillars are being built high above the ground. In fact, I told Katharina Prüm that I saw from the train to Wittlich more work being done on the highway leading to the bridge. She cannot understand why they continue to build the pillars and roads when the issues have yet to be resolved in regard to the unstable slate slope on the left bank, nearby Ürzig. But it’s clear that they want to get as much done as possible. Not only is the bridge unnecessary, the costs have increased dramatically. Stuttgart 21, Berlin Brandenburg Airport, and Nürburgring are other examples of such projects in Germany that have failed in so many ways. Thanks to David Schildknecht for forwarding me the latest news in regard to the Hochmoselbrücke. It’s an article in Spiegel Online. A geologist has filed a criminal complaint about the dangers of building a 160-meter bridge at this location. In December Pro-Mosel filed a criminal complaint against the building of the bridge citing insufficient planning, especially in regard to the safety of construction on a known landslide. The complaint included a statement by renowned geological engineer, Prof. Azzam of RWTH Aachen, who was surprised that the building plans did not reach prescribed safety norms. Following this, Prof. Azzam was invited to discuss his misgivings with the responsible authority in Mainz – the Landesbetrieb Mobilität Rheinland-Platz (LBM). The outcome of this meeting in December was an agreement to hold another meeting in January after further consideration of the issues. However in the meantime the building authority appears to have been tasked with trying to subtly undermine Prof. Azzam’s standing in the press (of which there has again been a great deal, none of it positive for the bridge). Today, that tactic proved to be yet another miscalculation. From today’s article in a leading publication of the building industry, International Construction News bi-BauMagazin, we learn that Prof. Azzam has now called for a building freeze, because he says the mountain in Ürzig is anything but safe. “The mountain creeps”, and building must be stopped. Prof. Azzam was shocked about what he found in his study of the plans: a harrowing record of incompetence, ineptitude and self-aggrandisement. Although there is a landslide at the Ürziger mountain, the required DIN standards for proof of stability have not been met. The whole planning is based purely upon an opinion. The studies that have been made are not complete or understandable. He could not find supporting documentation for earthquake and water security. Prof. Azzam said the whole thing “is just so off the cuff”. That you can build under these circumstances is “incomprehensible” to him and he considers the project to be “irresponsible”. He holds life to be in danger. Until a few weeks ago, Prof. Azzam thought it very possible that the documents he had seen were not complete and therefore he did not have all the necessary evidence, in particular for the stability of the bridge. He realised that this was not the case when the missing evidence was not presented at the meeting. The representatives of LBM could not even present evidence of the correctness of their own statements. On a recent trip to Traben-Trarbach, I saw from atop Ürziger Würzgarten that the building of the bridge is moving forward. The latest news on the bridge is that the costs will be even higher than before. The pillars are being completed, except for the ones on the Ürzig slope. These need to be further stabilized. It’s a real shame that this project has been approved.